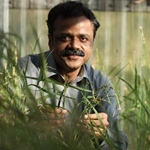 Naweed Naqvi obtained his PhD from the Maharaja Sayajirao University of Baroda (India) and the International Rice Research Institute (IRRI, Philippines) in 1995. He worked as a Rockefeller Foundation Fellow at IRRI until 1997, when he moved to the Institute of Molecular Agrobiology, Singapore for a postdoctoral stint in eukaryotic cell division. He subsequently started his independent research group at IMA focusing primarily on Fungal Pathogenesis. He joined the Temasek Life Sciences Laboratory as a Senior Scientist in 2002, and serves as an Adjunct Professor at the National University of Singapore. My research group explores the basic molecular-genetic mechanisms underlying fungal pathogenesis and host-pathogen interaction. The long-term goal being the elucidation of specific signaling and metabolic programs evolved by fungal pathogens to infect and colonize host tissues. We utilize the blast fungus Magnaporthe oryzae, and its major host, Rice, as a model pathosystem for understanding fungal virulence and host specificity. We rely on molecular genetics, cell biology, systems biology, chemical biology and synthetic biology approaches to understand the molecular and regulatory basis of infection-related development and to elucidate the stimulus-response relationship underlying fungus-plant interactions. We identified Rgs1 as a key regulator of heterotrimeric G-protein and cAMP signaling that responds to mechanosensory stimulus and host surface cues (Liu et al., EMBO Journal 2007). Our proteomics approach to identify the likely G-protein targets revealed an unexpected scaffold and trafficking mechanism (Ramanujam et al, Plos Pathogens 2010, 2012, 2013) for G proteins and cAMP signaling in rice blast. Currently, we utilize systems- and synthetic biology approaches to elucidate the surface recognition modules and spatiotemporal quantitative dynamics of cell signaling essential for infection-related development and in planta growth in Magnaporthe. The long-term objective is to identify the specific stimuli that trigger cAMP signaling and to determine the G protein effectors involved in the complex interaction between Magnaporthe and its host plants. Our exciting findings suggest that Autophagy is essential for hyphal growth, asexual development and pathogenesis in Magnaporthe (Deng et al., Autophagy 2008, 2009, 2012; He et al, Autophagy 2013). Currently, our goal is to identify the targets of selective and non-selective Autophagy in nutrient homeostasis, redox signaling and phototropism in fungal development and plant infection. Our novel forward genetics approach (Soundararajan et al, Plant Cell 2004) led to the identification of an essential role for Abc3 transporter in the host penetration step of Magnaporthe pathogenesis (Sun et al, Plant Cell 2006). Recently, we identified the Abc3 efflux Target Substrate (ATS) as a steroidal glycoside that shows structural and functional similarity to Digoxin (Patkar et al, Plos Pathogens 2012). Currently, we are characterizing the physiological functions of ATS during initiation of blast disease, wherein it appears to act as a potent effector molecule that governs Magnaporthe-Rice interaction. We also aim to identify polyketide or metabolite molecules that act as effectors in rice blast pathosystem. As part of a collaborative research program (National Research Foundation, Singapore; TLL-NUS-IRRI), our goal is to engineer ATS/effector and R-gene mediated broad-spectrum durable blast resistance in rice. Functional analysis and molecular recognition studies are currently in progress to identify cognate Avr-R gene pairs in the blast pathosystem. Thus far, we have identified two cognate avirulence factors from Magnaporthe (AvrPi9 and AvrPi2) and putative targets of ATS in rice. Natural variation in blast populations and the extent of blast resistance or susceptibility in rice cultivars is also being investigated.